← Data confirms what great leaders knew already! 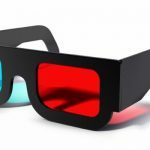 I have been a manager in the IT industry for almost 20 years, and have worked in that capacity at different companies. Through external forums, trainings and workshops, I also had the chance to discuss and work with managers and leaders from other companies on those topics. More often than not, when companies want to develop a manager or leader, and hope that this will boost their team’s productivity and engagement, they will likely send them to some kind of training. This is usually the first response to one’s development need. The challenge is that when it comes to soft skills (such as developing your coaching or listening skills, empathy, facilitation skills, assertiveness…), I have never been really convinced of the lasting effects of those trainings. Why? 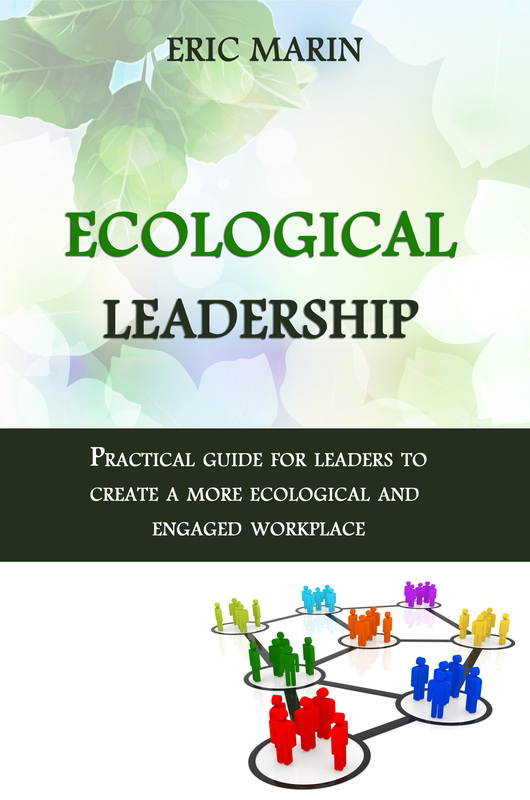 In short, because most of the time these trainings are primarily about fixing things or gaps, but are rarely designed to fundamentally help attendees to deeply change their behaviors, their profound way of being and operating in the world. It really takes a sustained effort for someone to not just change a few aspects of his leadership and/or management style, but to deeply transform himself. How many are we to have that awareness, discipline and stamina when we are coming back from a 3-days training and going back to our habits? Not only that! 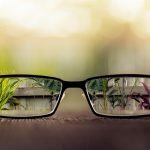 Depending on how management higher in the organisation sees the world, and because of their own filters, they are likely to identify and recommend the “wrong” gaps to be addressed. Here is a very personal example! At one point in my career, many years ago, a VP told me that, should I have wanted to further climb the corporate ladder, I needed to display more of the 3 “A”: Ambition, Aggression and (I forgot the 3rd A, I think it was Assertiveness). Aggression, really?! Contrast it with Google latest study and findings discussed in the previous post of that series! Which talks about kindness and providing a “safe environment” for teams to be at their best! Do we need a new approach to develop our managers, and hopefully as a result, our teams? I believe so. And I think this can only happen when we start to change our filters, how we look at the world and the people around us, how we operate in the world. As I look for myself, and try to “isolate” the one thing that really allowed me to perform at my best over the years, and I think, allowed people in my teams to do so too, I think I can bring it down to trust. Trust is the cement from which all success can be built upon. 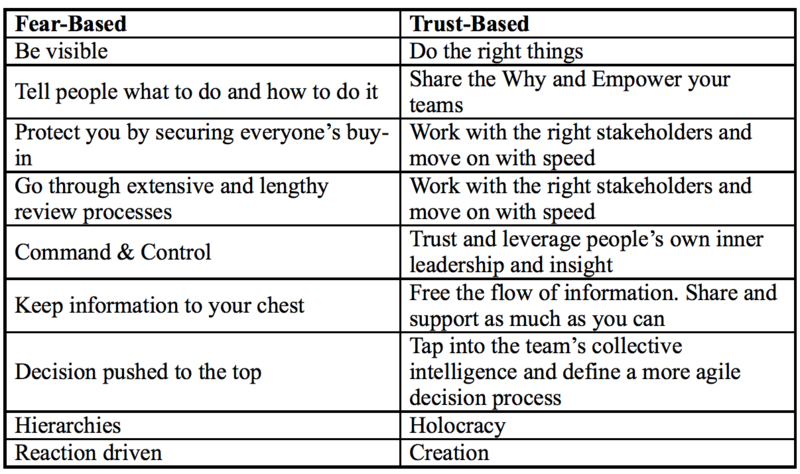 Patrick Lencioni‘s perspective on trust which he shares in his book “The Five Dysfunctions of a Team” is really interesting. He explains that trust is the essential foundation of highly effective teams (and organizations). 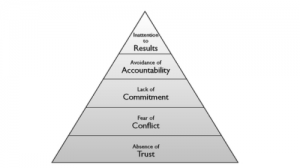 As can be seen from the pyramid below, lack of trust in the end leads to inattention to results. 1. Absence of trust: People do not trust the intentions of their teammates. They feel the need to protect themselves from each other and tread carefully around others on the team. This leads to the next dysfunction. 2. Fear of conflict: Without trust, people are unwilling to involve themselves in productive debates and conflicts, the type of good conflict that focuses entirely on resolving issues without involving character attacks or hidden personal agendas. Without such healthy conflicts, issues stay unresolved or are unsatisfactorily resolved. People feel they have not been properly involved in decisions. This leads to the next dysfunction. 3. Lack of commitment: When people feel their input has not been properly considered and that they have not been properly involved in decisions, they have no buy-in. They do not commit to the final decisions. Ambiguity about priorities and directions festers, and uncertainties linger. This leads to the next dysfunction. 4. Avoidance of accountability: When people have no buy in about decisions, they avoid accepting accountability. Worse still, they do not hold their teammates accountable to high standards. Resentment festers, and mediocrity spreads. This leads to the final dysfunction. 5. 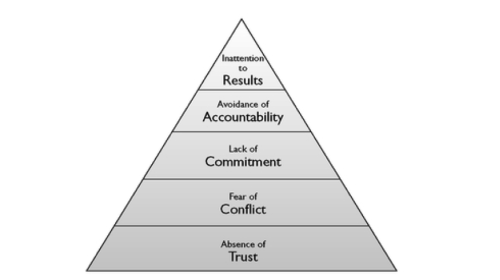 Inattention to results: The ultimate dysfunction of a team. People care about something other than the collective goals of the team. Goals are not met, results are not achieved. Looking at my own experience as a manager and, simply, a human being, I have tried to identify how shifting from a fear-based to a trust-based perspective gets translated in day-to-day situations at work.